State Sen. Ben Allen speaks at this morning’s press event. Photo: Dave Sotero/Metro. 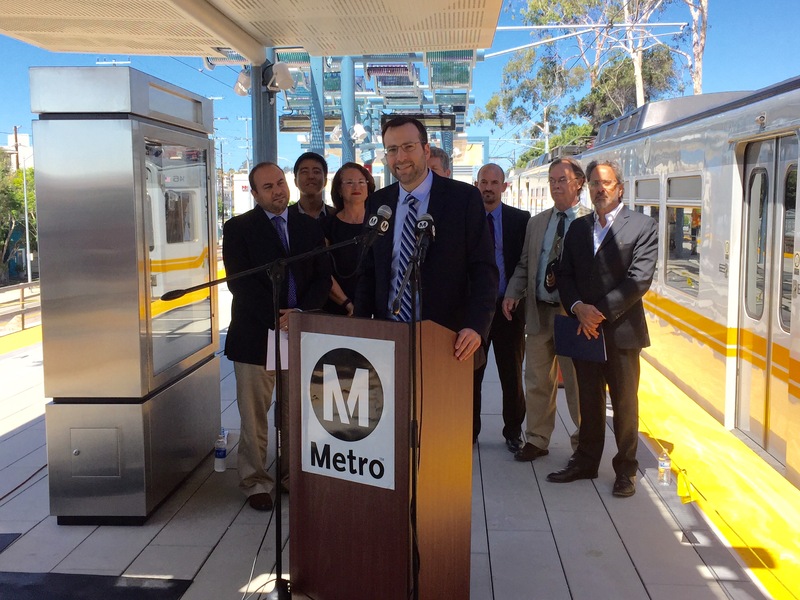 State lawmakers — Adrin Nazarian, Ben Allen and Richard Bloom — visited a future Palms Expo Line station on Friday morning to urge the passage of two bills to greatly expand transit funding. With the State’s roads, bridges and freeways slowly falling into disrepair due to lack of infrastructure funding, Governor Brown has called for a Special Session for legislators to discuss ways to address the problem. So far, public transit, which has its own infrastructure funding crisis, has not been part of the discussions. Transit advocates statewide are now entering the fray, arguing that public transit has a similar funding shortfall of about $72 billion over the next decade. Some legislators are now proposing ways to increase transit funding via additional Cap and Trade revenues, raising the tax on diesel fuel and other measures. Additional State dollars will clearly be needed in L.A. County, whose transit building boom is now in full swing thanks to the efforts of local voters who passed a new half-cent sales tax increase in 2008. The 30-year Measure R sales tax is expected to bring in $36 billion in new locally generated revenues to help fund the region’s critically needed transportation improvements. These include five new rail projects that will in the near term add 32 miles of rail service to Metro’s existing 87-mile network. These projects alone total $8.5 billion of local investment and include extensions of the Purple Line, Gold Line, Expo Line, as well as the new Regional Connector and Crenshaw/LAX Line. Coupled with Metro’s highway projects and other major initiatives, Metro’s transit transportation jumps to $14 billion in projects that are now “in the works.” The magnitude of L.A. County’s local transportation investment represents one of the most ambitious public works project in the nation. While Measure R and other local sources partially fund these projects, a State commitment also is required to maintain and operate L.A. County’s expanding system. Metro estimates that its transit assets will more than triple from $2.4 billion in 2005 to $7.8 billion in 2025. Keeping these assets in good repair will require $980 million by 2025, easily outpacing future available funding if nothing is done to address the gap. Because of its density, Los Angeles can no longer build new roads and freeways to solve its transportation problems. Public transit will play an increasingly pivotal role in providing a so-called “pressure relief valve” for mobility improvements, making it possible to move people more easily throughout the region. (Los Angeles, CA) State Senator Ben Allen and Assemblymembers Adrin Nazarian and Richard Bloom joined officials from the Los Angeles County Metropolitan Transportation Authority (Metro) as well as key regional transit advocates to call for over $900 million annually for critically needed public transit funding in California. Hundreds of millions of dollars would flow to L.A. County to help expand public transit options and maintain the existing transit system in a state of good repair. Governor Brown has called for a Special Session on Transportation that focuses on increasing funding to repair streets, bridges, and freeways. Legislators and public transit advocates are calling for a more balanced approach that repairs roads but also invests in public transit that accounts for more than 1.4 billion passenger trips annually in California. Since 1985, Los Angeles County has seen a spike of over 1.7 million new registered motor vehicles; resulting in the LA region ranking the worst in gridlock nationwide. According 2014 Inrix Traffic Scorecard, Angelenos waste an average of 64 hours/year stuck in traffic. The State’s transit infrastructure faces a funding shortfall of approximately $72 billion over the next decade. Senator Allen, Assemblymember Nazarian and Bloom joined with Legislators and transit advocates from the San Francisco Bay Area, who held a mirror press conference, echoing the urgent call for the passage of a mass transit funding package in the upcoming Special Session on Transportation. Increasing the diesel fuel tax from 1.75% to 5.25% will raise an additional $300 million for the State Transit Assistance (STA) program. The funding will be distributed to all transit agencies via the existing funding formula. Los Angeles would receive an estimated $85 million annually for mass transit projects. Cap and Trade funding is available for public transit projects through two programs – the Low Carbon Operations Program (LCTOP) and the Transit and Intercity Rail Capital Program (TIRCP). The bill adjusts the funding percentage of these two programs. TIRCP would increase from 10% to 20%, resulting in an additional $200 million per year. LCTOP would increase from 5% to 10%, resulting in additional $100 million per year for the program. Currently, Cap and Trade funding provides only $300 million for local mass transit projects. SBX 1 8 and ABX 1 7 doubles the funding for local mass transit projects to $600 million annually to help cities better connect and expand mass transit options; ensuring commuting by light-rail or subway is as convenient as driving. “Increasing funding through AB17X for transit and inner city rail and Low Carbon Transit Operations are important ways to get us out of our traffic gridlock. When paired with roadway improvements to and from transit stations, and Mobility Hubs — promoting connections to low-emission car share and zero emission biking, walking and shuttles – these funds will be a huge improvement to our mobility and our environment,” added Hilary Norton, Executive Director of FAST – Fixing Angelenos Stuck in Traffic. Legislators and advocates all stressed that only a balanced approach to repairing our roads and investing in mass transit projects will accomplish the Governor’s goals of reducing greenhouse gases, ensuring safe well maintained roads and bridges, and creating tens-of-thousands of jobs. Senator Ben Allen represents the Westside and South Bay communities of Los Angeles County. Of course, one can always argue why these public transit agencies are incapable of making money on their own and requires constant government assistance. You guys haven’t even tried converting parking lots to paid parking or adding retail to stations yet. It’s pretty obvious that you continue to drain money and you’re always going into the negative. No revenue from parking or train stations, yet maintenance needed for parking lots and train stations = net negative. This isn’t even Econ 101, it’s elementary school logic. Anything zero minus a large amount equals a huge negative number. Nothing is free. The costs of those freeways are enormous. Yes they aren’t asked to make a profit. CA has a dumb law that all LA freeways are free. Change the law and put tolls on them. And charge the amount it costs to cover all the pollution it causes. Technically “all LA freeways” is not correct. We have the Metro ExpressLanes on portions of the 10, 110 and 105 which the carpool lane is not free. Theoretically, carpoolers get it for “free,” but they still need a FasTrak transponder which comes with a $1 monthly maintenance fee attached to that. If it were me, I’d just make all LA County freeways tolled but drop the monthly maintenance fee. The ExpressLanes is already making more revenue than they imagined, it certainly could live without collecting the maintenance fee and just run it on their own. Since it’s proven to be effective on the 110, imagine how much revenue will it generate for places like the 405, 101, 10, 105, 605, and the 710. Massively deploy ExpressLanes throughout LA freeways, drop the maintenance fee as an incentive to encourage as many people to get it, and people will pay a bit more for convenience of being able to use the carpool lanes. Do something like San Francisco does and make FasTrak compatible with parking charges too. Did you know up in the Bay Area, FasTrak transponders can be used to pay for parking? Just zip in and out, without stopping and the parking fee is automatically deducted from your transponder account. Brilliant. Imagine what you can do that at parking lots here in LA too? The freeways and parking lots can become a huge money maker and those surplus can go a long way in making freeway, road, street, and sidewalk repairs, and perhaps some can even go toward making Metro even better. Isn’t the free parking an incentive to get people to park their cars and take the train. In time, the free parking will go away when the demand for the space is greater…. Metro recently had an APTA fare review panel earlier this year in which transit scholars from UCLA and transit experts from Chicago were invited to testify in front of the Metro Board of their findings. Their findings stated that giving away free parking isn’t doing much good to taxpayers and that the air quality benefits (reduction of cars from taking the train) aren’t that great. Personally, I think our MTA does an excellent job. When you ride public transportation in other cities in the nation, it does not come close to our LA Metro system. In many other cities in the nation where they charge more to ride a bus or a train does not mean that everything will be perfect. Some cities even charge extra to ride all buses and trains during weekday rush hours in addition to charging people to park in lots adjacent to train stations. Both MTA in New York City and Washington, DC who charge more to ride their buses and trains are having problems with their equipment and their infrastructure. Recently, there have been problems with delays of the DC Metro trains as well as the subways in New York City. In addition, both Amtrak and NJ Transit that use the tunnels between New Jersey and New York City have complained that the tunnels need to be repaired or replaced. We need free parking at transit stations to encourage ridership, otherwise choice riders will opt for the Automobile and the billions spent on the train is wasted. Don’t believe me? Looking at Metrolink’s station boarding numbers. Rancho Cucamonga lost 15-20% of it’s Metrolink riders simply because the city decided to charge for parking. Those freeloaders now park in Upland or Fontana. My view is that Metro needs to explore ways to find more funding of their own and start charging for parking at all Metro Park and Ride stations. Even a $1 a day (payable with TAP), would go a long way to secure additional funding than giving it away for free. Parking lots aren’t free too you know, they need maintenance just as stations do and it should start paying for itself, at least a portion of it. Choice riders will always be choice riders. They’re not a big majority of Metro riders anyway, the biggest users of Metro are the poor who do not travel that far, do not have access to cars, and will never use those parking lots. Put it another way, the poor are subsidizing the better off who can afford cars and their precious free parking. I say charge them, at least $1 per day. If they don’t like it, they’re free to go back to driving. Many of them will come crawling back and rather pay the parking fee once they realize that the freeways are jammed as always and spend 2 hours everyday just to commute 10-20 miles in bumper to bumper traffic on the 101. Remember when Metro decided to end the honor system? People said no one would ride Metro anymore and go back to driving cars because the honor system encouraged choice riders to take Metro. Guess what? People still ride Metro and Metro started recovering their losses. Granted, it’s still not perfect as not all the stations are gated, but now Metro is collecting more in fares and those fares can be used to make more upgrades to stations. The more Metro is able to make on their own, the more things Metro can do. If Metro can start charging for parking, it can make better improvements to parking lots. Ultimately, people who drive and park are going to see that it’s going to be the choice of more traffic on the streets of LA and spending more time in traffic versus a little more payment to get the convenience of mass transit. People will still use Metro and will come begging to ride them. Great story! I hope they come up with a fair balanced plan that improves overall efficiency. A lot of money goes through this state. If we really want to build a world class efficient and rapid transit system in every urban city in the state, we totally can. Would be nice to have a 500 mile rail system that reaches every corner of the county and possibly beyond.